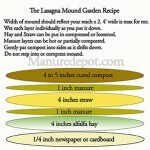 In my In The Garden articles about the Lasagna Layer Mounds the garden amendments straw, manure, and alfalfa hay are frequently mentioned. They are the ingredients for the garden mounds, but they are something else as well. Of course we know manure is a waste product from livestock farming or ranching, and we know straw, the part left over from grain production, was once a common livestock bedding and building material. When I began asking around at feed stores for straw for my gardens it was no where to be found. I had to wait weeks for special orders. Now both my local feed stores carry straw because local gardeners have created a demand for it. Alfalfa is different. Alfalfa is still one of the most common high nitrogen/protein feed hays for livestock. It has not been hard to find at the feed stores because it is still in demand by ranchers. Because of this summer’s drought in the southern plains states there is a higher demand for alfalfa hay. Ranchers in Texas and Oklahoma not only don’t have the locally grown hay on which they usually rely, their pastures don’t have live grass. Life begins and ends with water, and the weather conditions in another region affect us all. Right now we are seeing that in alfalfa prices. One of our feed stores is not going to be able to get alfalfa, and the other has it for $21.75 a small bale, and there are worries that the price of alfalfa hay will continue to rise. When I talk to people about starting a garden suddenly with a lasagna layer mound they often ask me how long the mound will last, and if they can assemble the same mound year after year. I don’t like the idea of building these mounds every season. It is ideal once we start growing to consider the next growing season as we are tending to the current one. 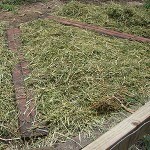 It is easy to prepare for the next garden by setting up garden mounds of brown leaves and manure, grass clippings and kitchen wastes, or fence corner composts, or planting green manure crops well ahead of the growing season so that we don’t have to rely on precious livestock feed for our gardens. I feel like this feed hay shortage due to a serious drought is a perfect example of one of the many reasons why we should have less reliance on expensive out of area resources, and learn how to make or find locally, the organic materials we need for our garden soils. This frees up feed hay for livestock and takes some of the pressure off of the system. 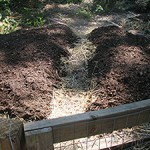 I recommend that we Floridians buy peanut hay rather than alfalfa for assembling the No Dig Lasagna Layer Mound. Last I checked it was under $15 for a 2 string bale, and it is plenty nitrogen rich for the purpose of growing. 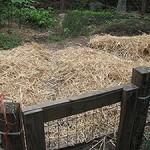 For the purpose of pursuing sustainable practices I am preparing to grow some green mulch crops. Lots of great grass crops grow well here in the winter including wheat, oats, and rye. Once grown and cut down the grassy leaves cover the soil, and the creatures and organisms of the soil have lots of organic matter to chew. Most grasses after being cut once re-grow afterward to make another crop, and if left uncut they will go to flower and set seeds. Several different kinds of cow peas including black eye peas and iron clay peas grow very well here in the summer and can provide cover and leaf mulch for our soil in addition to the nitrogen legumes fix and store in little fertile balls attached to their roots. This year we build Lasagna Layer Mounds, but we can prepare for next year by collecting leaves and manure or grass clippings, or growing green crops to cover and feed the garden soil. Previous: Previous post: In The Garden: October 2011, Plant Now! Fascinating! You always teach me something (or somethings) new!! !